VIB are mechanical components that exploit the elastic deformation of four natural rubber cylinders that are inserted between two hollow sections positioned 45° one to the other. The maximum rotational angle is ±30° from the neutral position. 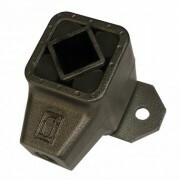 The VIB mounts use the VIB base elements as foundation and have been developed for various typical applications. These Technidea units all come with fitting flanges off the shelf and are interchangeable with industry standards. Other variations of design suitable for specific applications are also available upon request. Mainly used as rocker mounts in crank driven oscillating conveyor/vibrating screen applications with one chute. These units have left and right thread versions and are used in pairs to accommodate mount height adjustment, simply requiring a threaded bar to connect them. 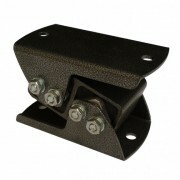 Recommended rocker mounting angle is 20 to 30 degrees. These units are used as the driving element on a crank shaft in oscillating conveyor/vibrating screen applications and can handle up to 23000N of acceleration force. TB is available with right hand thread. Left hand threaded version is also available upon request. 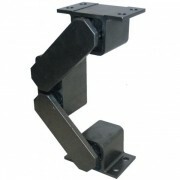 Used in conveyers or screens with two chutes. The Tecnidea design is a square structure welded all around to ensure the rigidity. 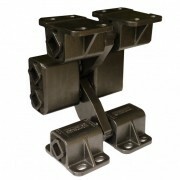 Available with the fixing flanges all on one side or with the middle fixing flange reversed. 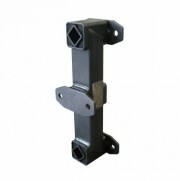 Mainly used as suspension mounts in vibrating motor driven oscillating conveyor or vibrating screen applications. These units have welded or cast flanges off the shelf and so you don’t have to make your own flanges. Design variations for special applications and in stainless steel are also available upon request. Heavy duty version of the DE-R units. These are mainly used in large conveyors or screens. 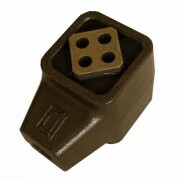 DE 70 SYM and DE 70/2 SYEM can be used with standard DE 70 R units, as they use the same rubber elements. A compact VIB unit used as vibration mounts in many applications for dampening of low to medium frequency vibrations, including impact beds in the mining industry.